Okay, so this is THE easiest cheese ever. For those who aren’t familiar with it, paneer is an Indian fresh (unripened) cheese with a dense texture and milky flavour. It doesn’t melt when heated (within reason) which makes it super cool! This amount makes the patty above, approximately 15 cm x 10 cm x 1.5 cm, enough for two people (or one, if you’re me). Very very easy to upsize, of course. Line a colander over a bowl with several layers of cheesecloth. Heat the milk in a heavy medium pot over medium-high heat. When the milk comes to a boil, turn the heat off and stir in the lemon juice. The milk should curdle pretty much right away, with the white curds separating from the greenish, thin whey. If it doesn’t want to go, add a little more acid. 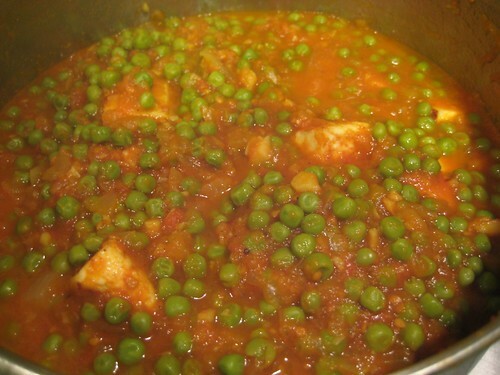 Mattar paneer is an Indian dish which translates to “peas and cheese” (guess which word means peas!). This is a medium-spicy dish, which you can, of course, adjust to your level of spice tolerance. I referenced my good friend Vivek for his recipe, but made a few procedural changes – supremely un-authentic, most likely, but easiest for me. This dish is a little time-consuming, but soooo yummy. 1. Heat some oil in a medium heavy pan over medium heat. Sweat off the onions slowly until they are translucent, at least 10 minutes. Add the garlic and ginger (I grated my ginger) to the pot and cook for another minute or two. 2. Push the onions all off to one side of the pan and heat a touch more oil in the bottom. Add the cumin, coriander, cardamom, turmeric, and cayenne pepper to the oil and fry through for a few seconds until fragrant. Mix the spices into the onions and add the chilies. 3. Add the tomatoes to the pot. Take the stick blender to the whole thing and give it all a whirr – I didn’t completely blend mine, but it should be pretty smooth. [This is a significant deviation from the original recipe, which has you make the onions into a smooth paste in the blender and then the tomatoes blended separately, but, well, I didn’t want to have to clean the blender! Plus my blender doesn’t work as well as an Indian grinder.] Add the salt and garam masala. 4. Cover and simmer over medium-low heat for 15-20 minutes. 5. Add the peas. 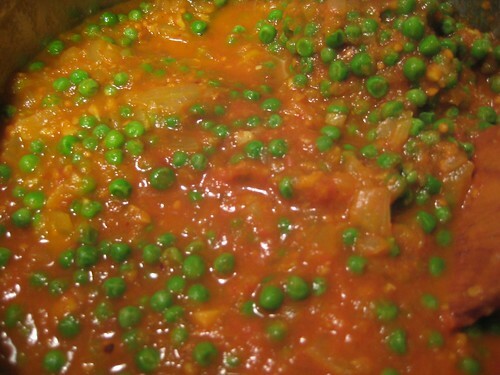 If you are using fresh peas, add them a few minutes earlier since they take a touch longer to cook. Cover and simmer an additional 10 minutes or so. 6. When you’ve gotten to the end of the simmering time, leave the pot on anyway while you toast the paneer. Heat a small, heavy frying pan over medium-high heat and add the pieces of paneer. Fry, turning often (I used chopsticks) until the pieces have golden spots and are turning crispy at the edges. 7. Add the paneer to the pot and stir gently. Turn off the stove and let the pot sit for 5-10 minutes, covered, or as long as you can stand it! 8. Garnish with chopped coriander leaves (cilantro) and serve with rice, plain or fancy. Ooh, and some yogurt or raita (yogurt with grated cucumber in it) is nice too. Serves 4-5. This looks awesome — thanks for sharing! Yummy, yummy! Thank you for the recipe. I need to pick up some cheese cloth to make the cheese. Thanks! Mmm, yummy! I love paneer and keep meaning to make it at home. I like Mattar Paneer, but my absolute favourite is Saag Paneer! I am ABSOLUTELY making this over the weekend. It looks delicious! Thanks for sharing the recipe. Thanks for the recipe! I’m bookmarking this…it sounds yummmmmy. Thanks for sharing … I love to eat paneer when we go out but have never had an idea about how to fix this at home. I look forward to trying it out! I made my own paneer once and it was really good. Unfortunately my saag paneer was a sad dissapointment. I’ll have to give this a try for sure! Wow, I am shocked that paneer is so easy to make! Do you know how much they charge for that stuff in the store? Disgraceful. I am excited to try this out and I bet it would be fantastic with a side of naan or roti. Thanks for sharing your recipe and tips. 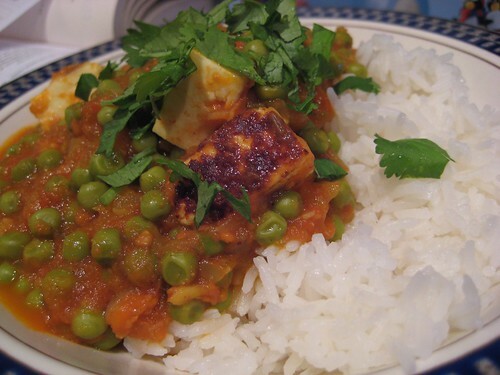 We love to cook Indian food but I had no idea Paneer could be so easy to make at home. I’m excited to make this dish tomorrow! Those photos literally made my mouth water – and I’ve just had breakfast! That’s just beautiful, Laura. This is in my “to make” queue. So easy! Thanks, Laura! This is one of my favourite things to eat in the whole world. Oh yum! And thanks so much! I can’t wait to try it…now to just find a blender :). This is wonderful. I can’t have fermented/yeast foods but I can have some dairy. Will need to try this cheese!!! I’m all for something with 2 ingredients in it, the soy and rice cheeses at the health food store have so many unpronounceable ingredients I have not had the courage to try them. And the main dish sounds wonderful, too. Will leave out a few of the spices and it will still be tasty. I’ve been craving Indian food lately. This is great timing!!! 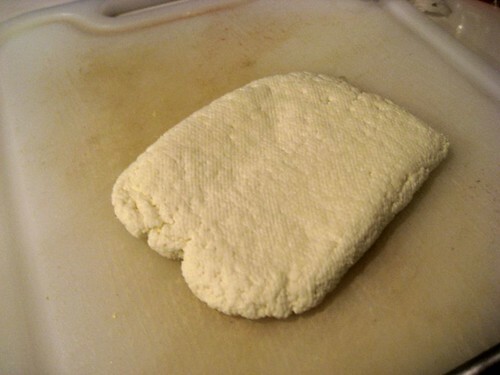 I make paneer all the time (well, not all, but quite frequently). I also like making yoghurt cheese, because it is completely lazy easy. My vegetarian Indian cookbook is one of my favorite cookbooks with instructions for the different Indian cheeses. Oh, wow! Thank you so much for posting this! We love Indian cuisine; it’s our favorite. I know one recipe, a curry, that I can make really well, and I got that recipe from a knitting blog! Now, I have another one I can make. Do you have any more? I would love to have them. Thank you! Have you tried to use buttermilk as the acid instead of vinegar or lemon juice? It makes for very tasty paneer and a higher yield. Mark Bittman has a recipe in How to Cook Everything Vegetarian, I think it’s a whole quart that he calls for. You’re amazing. 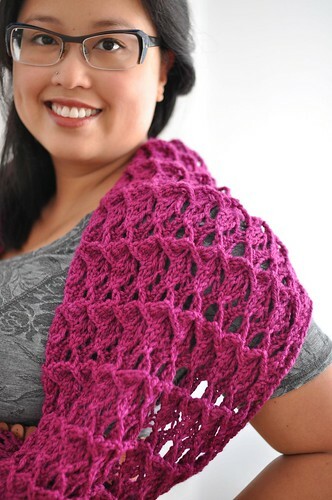 I check out your site for your knitting prowess, and what do I find but a terrific recipe. Awesome! I’m making it today! I was so excited to try this, but I ended up with a much smaller amount of paneer. my little patty was about 10cm x 7cm x.75cm. I did use 2% milk fat milk. Would that cause the problem or did I maybe not have enough layers of cheese cloth? I think I used about six. I want to try it again and hopefully get it right so that I can make the whole recipe. I cannot wait to make this! I would like to thank you for the efforts you’ve put in writing this blog. I am hoping the same high-grade site post from you in the upcoming also. In fact your creative writing abilities has inspired me to get my own site now. Really the blogging is spreading its wings rapidly. Your write up is a good example of it.